For a long time, SharePoint has provided the means for mainstream collaboration solution. It featured as, the most popular document management & application development platform. Hordes of large and small applications were created to support departmental/groups functions. Most of SharePoint enterprise users are now considering leveraging the use of new SharePoint 2013 for the new collaboration and content management features. 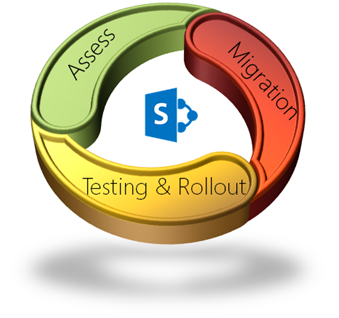 This White Paper discusses the SharePoint migration challenges involved in such migrations. It also provides insight into Axisvation SharePoint Migration Framework capability, expertise and service offerings. Today SharePoint is most popular and widely used Collaboration Platform, and has gained huge acceptance in large enterprises and also in SMEs. However, lately due to advent of new modern business requirements, enterprises have started to compare and evaluate capability and features of SharePoint 2007/2010 with SharePoint 2013. SharePoint provides customers with the ability to easily create and manage their own content-rich sites, connecting users to the data they need while enabling collaboration across the enterprise. SharePoint Server 2013 has been optimized for the way people work, providing people with a familiar, consistent view of information, collaboration, and process, and IT with a comprehensive, easily-managed and integrated platform to meet the needs of the business. The biggest challenge for any organisation is in knowing the entire inventory of SharePoint applications, and knowing how many of these are actively used, and deciding how many should be migrated. This is a challenge as such applications that are spread across multiple farms, servers and locations. List of all SharePoint Farms, Servers, Server hardware details, Application Install path, Services running on server, etc. Inventory of Web application, Site collection, Custom solutions like Web Parts, Features, Event handlers, etc. While gathering the SharePoint Application inventory, you may categorize and group them, based on Business, Technical & Design parameters, which may not be always, correct. SharePoint OOB (out-of-box) template based applications are simple & easy to migrate. The complexity comes when you have SharePoint Custom developed application to be migrated. Heavy customized Master Pages & Page Layouts User Interface. Custom Search scopes, external content sources. There were many approaches to migrate from SharePoint 2003 to SharePoint 2007, and from SharePoint 2007 to SharePoint 2010. But in case of migration to SharePoint 2013 you have only one approach which is OOB supported by SharePoint and that is Database-attach method. In-Place upgrade is not supported in SharePoint. Alternately you have also option to migrate using third-party migration tools available in market. Sensing opportunity in SharePoint Migration space, many Tool Vendors has come out with their Migration Tool offering. There are many challenges in migrating heavy custom-built applications using these tools. A test migration run with each shortlisted tool is recommended to evaluate the various tools being offered. It is a good idea to assess and take stock of your SharePoint Application Inventory to know your SharePoint Application landscape and Application Inventory. This Tool based Assessment gives various information on the SharePoint Application like SharePoint OOB template used, number of web applications, site collections, sites, sub sites, lists, web parts etc. Most of the Migration Tool vendors have their own Application Assessment Tools to evaluate and recommend the approach. Once the Migration is complete based on selected migration approach. In case of Database-attach approach you may face many challenges post Migration as many SharePoint design elements are notmigrated successfully. Here one should be ready with all the Post migration steps and work around if no out-of-box solution is available. Depending on the customisation of the SharePoint application, this could potentially result in a lot of post migration related activities. Typically, these would include moving 14 hive folders like images, js, css, etc., master page customisation, visual upgrades, update web.config, resolve absolute URL issues, resetting views for List view Webpart, configuring search scopes, etc. The "In Progress" workflow tasks, will have challenge to migrate. SharePoint Web Analytics system is not available in the newer version now. Its been replaced by new 2013 search service. The previous analytics reports will not be imported into new version. SharePoint Migration Project becomes complex if you have Applications/Sub sites to be migrated in hundreds/thousands, and content size is huge, you need to better plan such migration projects. Large migration projects are generally distributed in smaller migration lots for ease in migration, but managing multiple migration-lots with multiple migration-teams is another challenge. SharePoint Web Application Migration prioritisation is a big question - whether to migrate complex application lot first, which will increase the confidence of the migration team and user community, or Plan for simple SharePoint OOB template base application migration, which will migrate quickly and can be released to user community. Normally this decision is driven by business or User requirements. Setting up the environment for Migration & Testing is a challenge. If requirement is for migrating multiple multilingual applications, than you need to verify Migration Tool capability for such requirements. Consider content Migration Time for large Content database with large size attachments, this typically takes significant time while migrating content with Migration Tool. As Migration progresses, you need to plan for Farm Design & Topology, Taxonomy, Capacity Planning, Scalability Requirement, Backup and Disaster management, User Training etc. Team Composition - Good background on SharePoint 2013 is a must, with strong knowledge in SharePoint 2013 new features is an advantage. Knowledge of existing Migration tools in Market to the Migration Project team would be added advantage. Axisvation has developed a SharePoint Migration methodology. The Migration methodology address all the challenges mentioned above, and increase the success rate of the Migration program. Best fit migration approach - Content DB or Tool based. Post Migration Maintenance and Support. Organizations who have decided to migrate to SharePoint 2013 should plan the Migration program very carefully, as this is not a normal project development cycle, various parameters are key to success of Migration program. Executing such migration program in-house has a larger risk factor in terms of migrated application, migration efforts and schedules. Involving IT & Business Users early in the migration program with a proper Planning and Strategy will ensure success in planning and execution. It is advisable to Involve Migration experts on the projects who will implement proven Migration Methodologies & Processes, Assess & select best fit Migration mechanism, also consider usage of SharePoint Assessment Tools to capture SharePoint Web Application landscape and inventory which will insure success in Migration processes.